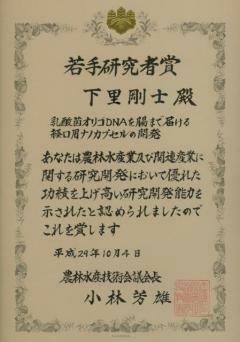 On October 4th, Associate Professor of Institute of Agriculture (Director of Research Center for Fungal and Microbial Dynamism) Takeshi Shimosato has received a prestigious "Award for young agriculture, Forestry and Fisheries Researchers 2017" from the 13th Agriculture, Forestry and Fisheries Research Council of the Ministry of Agriculture, Forestry and Fisheries (MAFF) . 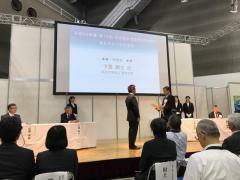 Associate Prof. Shimosaka was conferred the award in recognition of his research work entitled, "Development of nanocapsules for oral use to deliver lactobacillus oligo DNA to the intestine". The award is given to young researchers who have achieved outstanding performance and young researchers who have retained research achievements leading to future technological innovation. It was recognized that, in addition to developing "nanocapsules" delivering oligo DNA to the intestines instead of administered by injection, this research may also be applicable for future use in functional foods and livestock feeds. 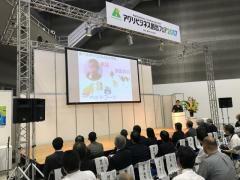 The awards ceremony and the awards lecture were held in the venue of Agribusiness Creation Fair 2017 (Tokyo Big Sight).